Quantity: For each 7-quart canner load, you need an average of 24 1/2 pounds of fresh grapes. For each 9-pint canner load, you need an average of 16 pounds of fresh grapes. A lug weighs 26 pounds and yields 7 quarts to 9 quarts of juice - an average of 3.5 pounds per quart. Quality: Select sweet, well-colored, firm fruit. Look for grapes at the ideal stage of maturity for eat fresh or cooking. 1. 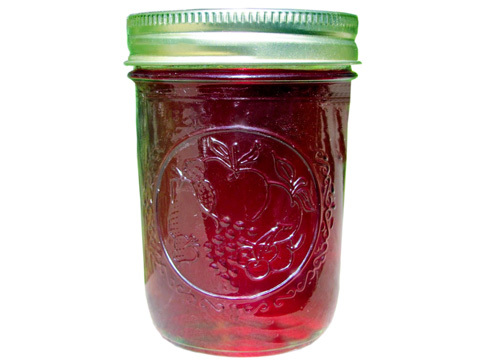 Wash and rinse canning jars. Sterilize by boiling in water bath canner for 10 minutes. Keep in hot water until ready to use. Prepare lids according to manufacturer's directions. 2. Wash and stem grapes. Place grapes in a saucepan, crush and add boiling water to cover grapes. Heat and simmer slowly until skin is soft, about 10 minutes. 3. Strain through a damp jelly bag or double layers of cheesecloth. Refrigerate juice for 24 hours to 48 hours. 4. Without mixing, carefully pour off clear liquid and save; discard sediment. If desired, strain through a paper coffee filter for a clearer juice. 5. Add juice to a saucepan, and sweeten to taste. Heat and stir until sugar is dissolved. 6. Continue heating, stirring occasionally, until juice begins to boil. 7. Pour juice into sterilized jars immediately; leave 1/4-inch headspace.